Celebrity wedding dress designer Vera Wang has separated from her husband, Arthur Becker, after nearly 23 years of marriage. Their separation comes just two weeks before their 23rd wedding anniversary. 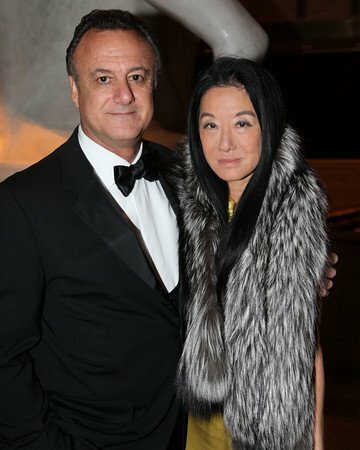 Vera Wang, now 63, was 39 when she wed Arthur Becker, a computer executive who has become increasingly involved with the Vera Wang brand over the years. According to WWD, Arthur Becker has advised Vera Wang closely as her business developed from an Upper East Side one-stop bridal shop into a global multimillion-dollar brand, becoming more involved with the day-to-day operations of the business in recent years. The couple married at the Hotel Pierre in 1989 after becoming informally engaged in 1988 during a trip to Hawaii, and have two daughters, Cecilia and Josephine. At the time of their marriage, Vera Wang, also a former Vogue editor, was design director for Ralph Lauren women’s accessories and at-home wear. In 2006, Vera Wang described her marriage as a surprise to New York magazine. She said: “I was the girl who nobody thought would ever get married. I was going to be a fashion nun the rest of my life. There are generations of them, those fashion nuns, living, eating, breathing clothes. “But Ralph [Lauren] said, <<Get yourself a husband and a family>>. Anna [Wintour] said, <<You have got to get a family going here. You’ve been single for three decades now>>. So I married my husband. When it comes to her own wedding dress, Vera Wang scoured department stores and bridal boutiques but only found a “sameness to everything”. Eventually Vera Wang gave up and hired a dressmaker to create her own gown, for $10,000. In 1990, Vera Wang opened her own design salon in the Carlyle Hotel in New York, featuring her now trademark bridal gowns with financial backing from her father. The Vera Wang label quickly took off, earning praise from the fashion elite for its luxurious fabrics, exquisite detailing and modern interpretation of classic lines. Vera Wang has made wedding gowns for many well-known public figures, such as Chelsea Clinton, Ivanka Trump, Victoria Beckham, Jennifer Garner, Sharon Stone, Sarah Michelle Gellar, Kate Hudson, and most recently, Kim Kardashian.